Capitalizing the skills of our professionals, we are offering an extensive assortment of Fabric Tags. The Fabric Tags we offer are recommended amongst the clients for their availability in various sizes and specifications that can be customized as per the requirements of the clients. Backed by skilled workers, we are enthusiastically indulged in the field of providing a range of Fabric Tags. Prices may vary according to product/samples. We are one of the leading manufacturer and supplier of Fabric Hang Tag , we are supplying wide range of quality products with efficient pricing. Our company holds immense experience in this domain and is involved in offering wide assortment of Fabric Tag. We are engaged in offering an extensive gamut of Fabric Hanging Tags to our customers. The product is manufactured using finest quality cotton that increases its durability and quality. Furthermore, these are made as per the specifications detailed by our valuable clients. 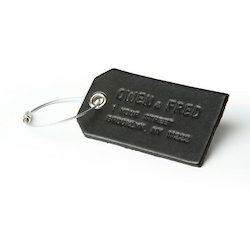 We have carved a position amongst the customers for offering wide range of Fabric Hang Tags. We offer products to various industries for their usability. Our products are manufactured by our experts in various designs and patterns. These are highly demanded in the market for their high grade quality. Having years of experience in this business, we are into offering a broad range of Fabric Hang Tag to our respected customers. 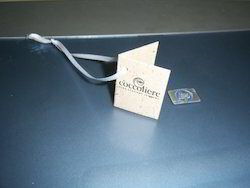 This Fabric Hang Tag is used for branding purpose in ladies bags and various other items. To attain maximum client satisfaction, we offer these products at most affordable rates. Having superb quality, these brand Fabric Hang Tag are extremely versatile. Our range is available in various color shades, designs, sheet sizes and layouts to meet the exact requirements of the clients. The labels that we offer are at par with industry standards and are reckoned for their durability & utility. Our company offers a range of Cotton cloth tag specially made from Cotton and similar fabrics. These tags are made according to coustomer's needs and wants. We offer a range of these tags in various shapes and sizes.